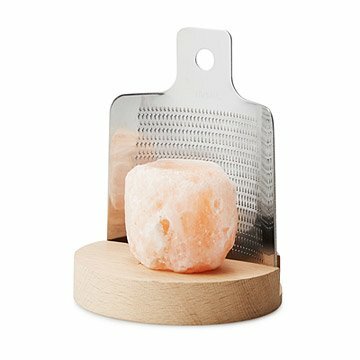 Tap into the benefits of Himalayan sea salt with this rose-colored salt rock and mini grater. Containing all 84 elements found in our bodies, Himalayan salt packs some pretty amazing benefit; it's known to help regulate water content, and balance pH and blood sugar. You can tap into this superfood's perks with this handsome set that includes a chunk of Himalayan salt and a miniature grater made of beechwood and stainless steel. Simply grate the salt over dishes as you would with standard table salt and enjoy its complex favor and subtle healing powers. When not in use, this duo makes an elegant and earthy statement piece in the well-appointed kitchen. Grater made in China with salt from Pakistan. I love this product! It makes any food tastier and is easy to use! I would definitely recommend it! It just is a truly unique and FUN gadget to use and display! I cannot wait to make another batch of caramels so I can salt them with this set. My husband is going to wonder if I truly bought it for him or secretly for me. This is very cute. The salt is tasty. However: the grate produces a salt so fine that it dissolves almost instantly on food, so you don't get the burst of flavor from crystals dissolving on your tongue. It grates so slowly that you can really ONLY use it as a finishing salt, so the whole point ought to be those crystals. My biggest issue with it is that the grater is curved and the slot for it is straight. WHY. Isn't this an item specifically designed to look clever and be a focal point on the table? Overall, I found this pretty useless and poorly designed. Still giving a few stars since you do get a nice hunk of the salt and it's a good idea even if not well executed. Salt has great taste, but it attracts moisture and melts into a puddle in damp environments. Grater is not marked "stainless," so I imagine it will soon rust, with trapped salt fragments turning into water. Grater is cute but not serviceable â€” plain, flat stainless steel kitchen grater works better. Although smaller than expected, still a good product. New guests always comment and want to try it. Super easy to use (like a cheese grater). Grates the salt VERY fine so I keep a grinder handy too for the more common occasion that I want more salt flavor. The finer grate is probably sufficient for someone with normal taste buds though ;) i wish the salt block was more irregular shaped, I think that'd be more aesthetically pleasing but i have no real complaints. The taste makes a difference! Not just a fad, the salt adds the taste you want, but a little goes a long way. Think : the taste of a pinch of real Parmesan cheese versus that little green shaker processed cheese! We love salt even more now!